Often I tell clients that they can't be all things to all people. Not true when it comes to SkyMall. If you've ever been a captive audience, aka bored airline passenger, chances are you've flipped through a catalog or two in your time. It's as much a matter of want versus need but almost any hobbyist can find their fix in a SkyMall catalog. Like cats? There's stuff with cats on it. Like golf? We got you covered. Cigars? Gadgets? Christmas trees? Got it, got it, got it. Whether you opened it to pass the time, or were really and truly searching for something specific, the SkyMall catalog was there for you. Like a pair of comfy slippers, or a repeat episode of your favorite show, you can depend on it. Remember when planes had phones on them so you could make calls? And place your order on the spot? Remember when you could order from the flight attendant? Am I dating myself here? Well, now you can grab the plane's wifi and order from the skies, or grab the catalog when you deplane. Better yet, what if you never ever had to travel to get everything you want? The power of the interwebs brings the magic of SkyMall straight to you. Desktop, laptop, tablet, mobile...choose your own adventure. Whatever you're shopping for, SkyMall has it. 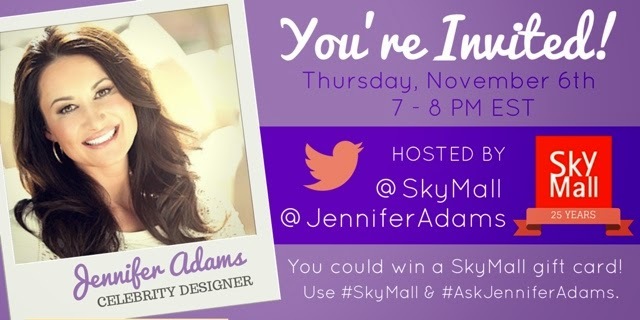 And if home decor is your project du jour, then you MUST join me this Thursday, November 6 from 7-8 pm, where I'll be co-hosting a Twitter party with SkyMall (@SkyMall) and celebrity designer, Jennifer Adams (@JenniferAdams). Use #SkyMall and #AskJenniferAdams to get your questions answered. You can even win a SkyMall gift card! Note, it's Day four of #NaBloPoMo and I'm still in the zone. This post is #sponsored, but my catalog shopping addiction, and all other opinions are always entirely my own. But, you already knew that, right?